Those who are working with non-marine molluscs may have encountered the name of Morelet. He introduced more than 700 species names in – currently – 84 different families of land and freshwater molluscs. Who was Arthur Morelet and what has become of his huge collection? Pierre Marie Arthur Morelet (1809-1892) was an amateur scientist who devoted himself to both shell collecting and botany. He organised several expeditions, of which those to Cuba and Central America (1846-1848) and the Azores (1857) are especially noteworthy. His contributions to malacology were thus significant and we have reconstructed his legacy with a survey of archival sources and his type material in the historical collections of several museums. The resulting monograph is made up of two parts. In the first part we present a bibliography, some remarks on the whereabouts of his collection, and more than 200 recovered letters (transcribed and translated) to contemporary malacologists, such as Crosse, Fischer, Baudon and Dautzenberg. His contact network has been reconstructed using data from his correspondence and his publications. This part offers an unique view into the world of malacology in the second half of the 19th century. In the second part a bibliography of Morelet is presented, as well as all his newly introduced taxa, with detailed documentation and figures of the species. More than 80 per cent of his type material has been re-found and original figures, if they exist, have been reproduced for the remaining species. Of the taxa represented by actual shell material, more than 150 are now figured for the first time. The book has indices for both taxonomy and persons mentioned and is a must-have for anyone interested in the history of malacology and those dealing with non-marine molluscs. € 67.50 (net price, excluding postage). Breure, A.S.H., Audibert, C. & Ablett, J.D., 2018. 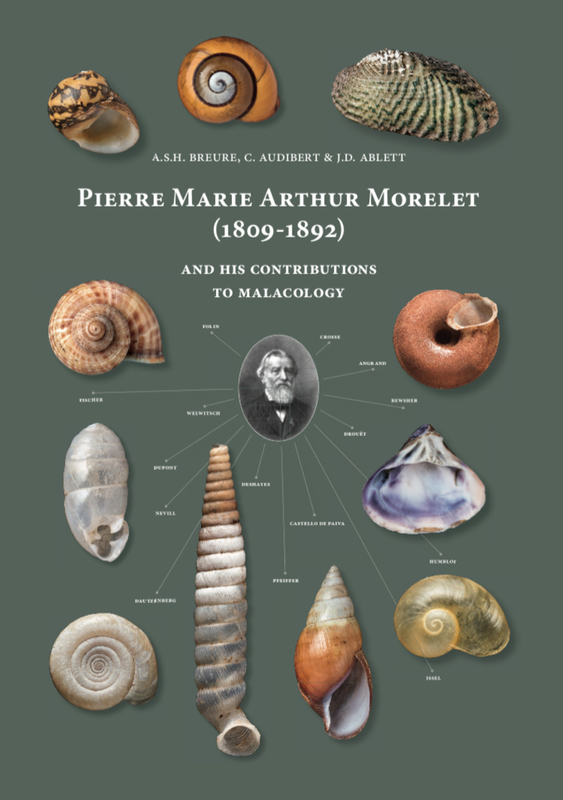 Pierre Marie Arthur Morelet (1809-1892) and his contributions to Malacology. Netherlands Malacological Society, Leiden, 544 pp. This entry was posted in Uncategorized and tagged publications, varia on May 25, 2018 by bramb. The indispensable BHL is now even better: recently a ‘inside search’ button has been added, which allows the user to make a free search within the item under inspection. Read the full story here. If you have used archive.org full text search you’ll know that the system shows the pages where your search term appears once you open the item. The BHL interface doesn’t do that, and you have to repeat the search within the item, but when done it shows the contexts and gives page links. Nevertheless, this will make searching for and within historical taxonomical literature much better and also save lots of time. Very nice! This entry was posted in Uncategorized and tagged varia on May 15, 2018 by bramb. 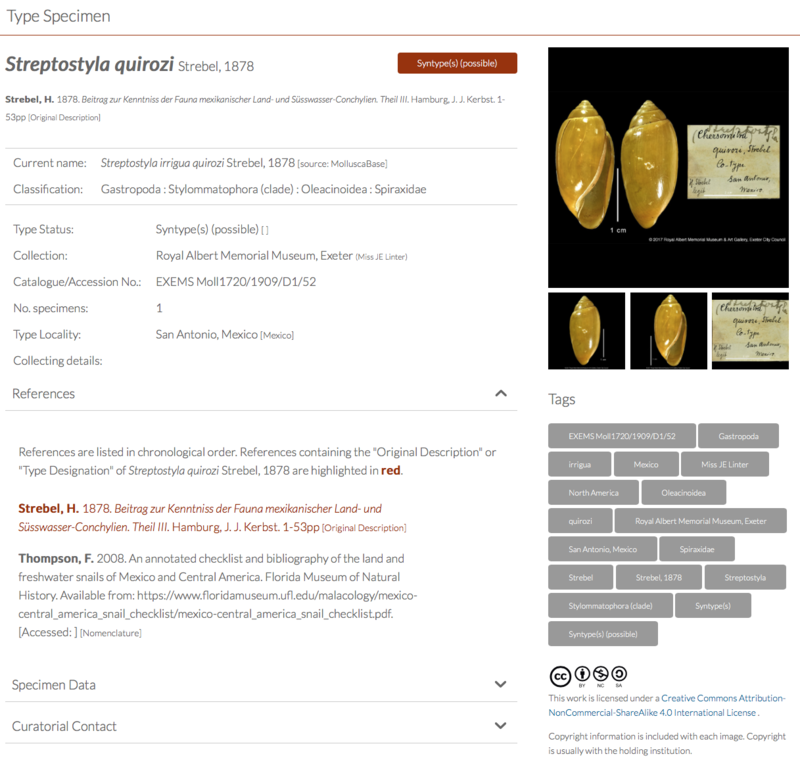 Just announced: a new website which gives access to information (and images) of molluscan type material in the United Kingdom. The announcement read: “The Mollusca staff of the Natural History Museum, London and the National Museum of Wales, Cardiff have been working to digitally unite the type specimens found in Mollusca collections across Great Britain into one comprehensive database. Thanks to the John Ellerman Foundation’s Regional Museums and Galleries Fund the first phase of our project has now been released, bringing together the type collections of seven partner Museums (Manchester, Liverpool, Leeds, Glasgow Hunterian, Glasgow Kelvingrove, Exeter and Newcastle). The curatorial staff from the leading institutions have been able to help research, catalogue and photograph c. 600 primary types to unite them as never before. Our online database also gives examples of handwriting to help identify type material as well as information and resources to assist in tracing historical mollusc collections including an updated Appendix IV from S.P. Dance’s ‘A History of Shell Collecting’ (1986) reproduced with kind permission of the author. The database presents excellent photographs and various ways to search for specimens. It is an important source for anyone looking for type material from historical collections, especially if the collector resided in the UK or the collection is known to be in museums there. However, as the illustration above shows, also unexpected finds are possible. This entry was posted in Uncategorized and tagged collections, historical collections, types, varia on April 14, 2018 by bramb. 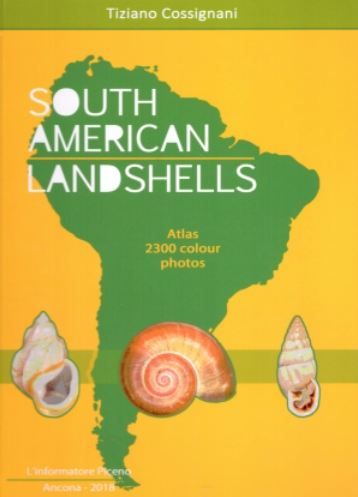 Time for a malacological tidbit… No Neotropical but Palaearctic snails are the topic of today. These photographs were made by Vyachelav Mischenko and were taken from the Dutch site Paradijsvogels. Enjoy! This entry was posted in Uncategorized and tagged varia on March 20, 2018 by bramb. 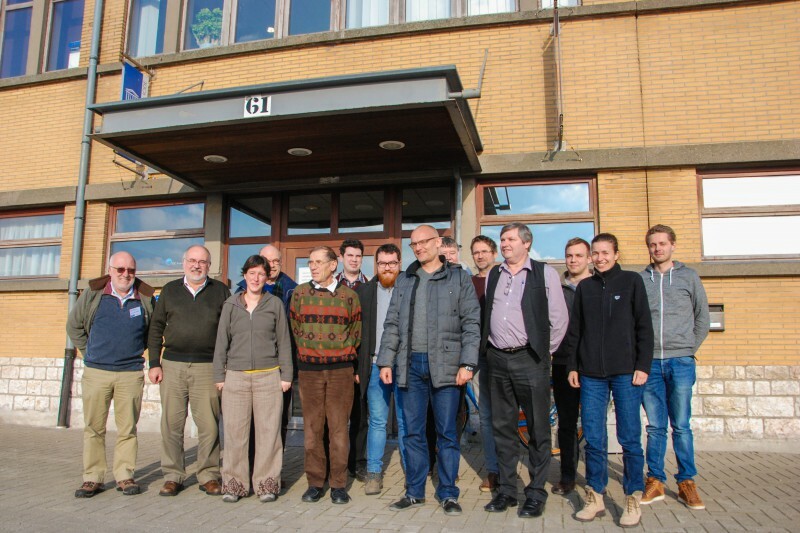 In the week of 5-9 February, the Flanders Marine Institute (VLIZ) – host of Aphia, the online platform behind WoRMS and its many subregisters – welcomed Mollusca-experts for 4 days, to expand the content of MolluscaBase with their freshwater and terrestrial representatives and to document species traits. 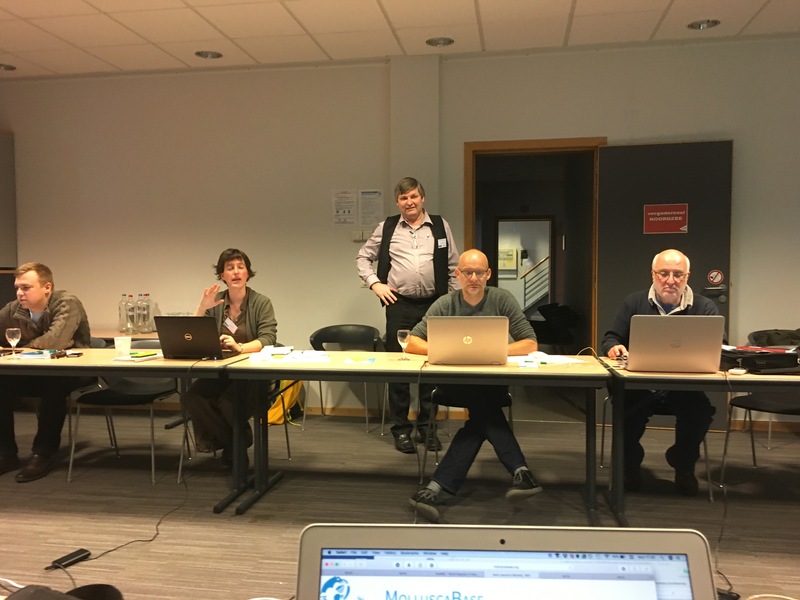 Eleven taxonomic experts joined the Data Management Team in Oostende, to learn how to use the online editing platform so they can add the freshwater and terrestrial counterparts to the already ongoing initiative of MolluscaBase, which had until recently had a focus on documenting its marine representatives. 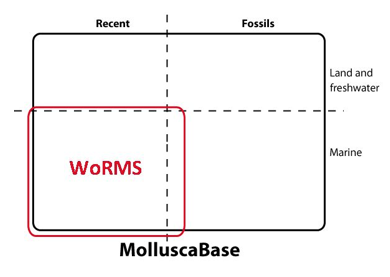 In 2017, the terrestrial Mollusca part of Fauna Europaea and the bivalves parts of InvertEBase (Authority files of U.S. and Canadian land and freshwater mollusks) were added to MolluscaBase as well as a master list of the genus-group names of land snails of the world, creating the backbone and nucleus of the non-marine part of the database. During the workshop, attention was given on how to add information to through the online interface, and on how to deal with e.g. the status of a name, names including subgenera, and the treatment of names that are first published electronically. During two days of hands-on work, almost 200 species were newly added through the online interface. On top of that, the upload, by the DMT, of an existing file from one of the editors resulted in an additional growth of MolluscaBase with more than 600 valid species, bringing the total entry of new Mollusc species during the workhop to about 940! And also immediately after the workshop, the addition of species continued, resulting in an extra >700 species being added.There are now exactly 65,000 valid species of molluscs in MolluscaBase, of which 47,696 marine, 3,262 fresh, and 5,573 terrestrial (all Recent), plus 8,900 fossil only species. It is expected that it will take 2-3 years to index the remaining valid non-marine species. In addition, more experienced editors within MolluscaBase dedicated their time to quality controlling and adding new traits information, where they put the focus on (1) functional group information and (2) feeding type information. They were able to verify the already present information on benthos – plankton – nekton – neuston and to add this information on all levels where this was still missing. As a result, all aquatic Mollusca species are now assigned to one of these groups, which is an enormous step forward for the traits-part of the Aphia database! Following the functional group trait, the experts started tackling the feeding mode of Molluscs, which is now documented in detail for about 30% of the Mollusca species. Lastly, the group also paid attention to enriching MolluscaBase with good images, and plans have been made to collaborate with museums and institutions on this topic. 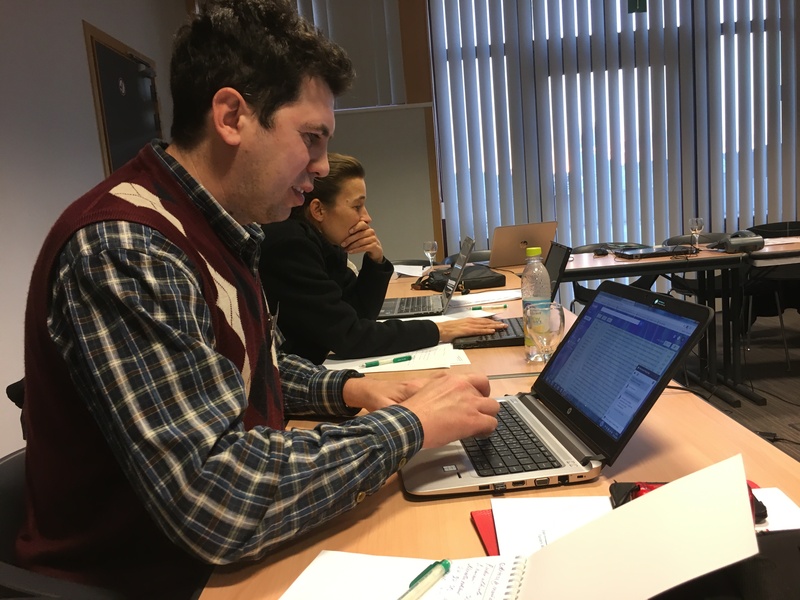 The organisation of the workshop and the support of the Data Management Team (DMT) are supported by LifeWatch Belgium, part of the E-Science European LifeWatch Infrastructure for Biodiversity and Ecosystem Research. LifeWatch is a distributed virtual laboratory, which is used for different aspects of biodiversity research. The Taxonomic Backbone of LifeWatch aims at bringing together taxonomic and species-related data and at filling the gaps in our knowledge. In addition, it gives support to taxonomic experts by providing them logistic and financial support for meetings and workshops related to expanding the content and enhancing the quality of taxonomic databases. This entry was posted in Uncategorized and tagged varia on February 22, 2018 by bramb. For those who do not know it yet, some years ago it was decided that the marine species list (WoRMS) should be extended to incorporate also the land and freshwater species. 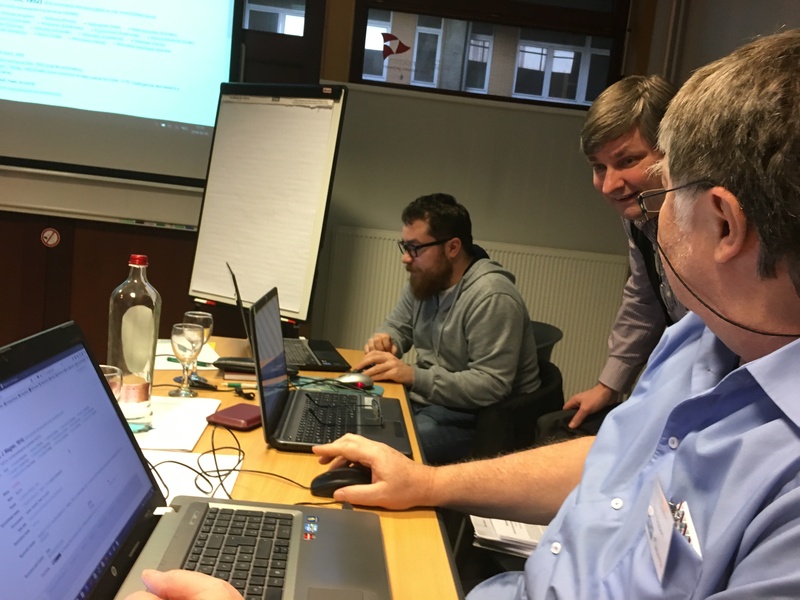 This week a workshop has been held in Ostend (Belgium) to bring a number of new editors into the team of – now officially called – MolluscaBase. They include Dai Herbert, Frank Köhler, Barna Páll-Gergely, Ira Richling, Maxim Vinarski, and myself. Together with Eike Neubert and Ruud Bank we will enter newly described land and freshwater species and genera into the system, and also work on the ‘backlog’ of all pre-2018 described taxa (some have already been done). From left to right: two members of the data management team at VLIZ, Ruud Bank, Frank Köhler, Dai Herbert. From left to right: Barna Páll-Gergely, Ruud Bank, Eike Neubert. From left to right: Maxim Vinarski, Ira Richling. MolluscaBase is a taxonomically oriented database which aims to provide an authoritative, permanently updated account of all molluscan species. The basic taxonomic unit in MolluscaBase is the binomen, i.e. the combination of a genus name and a specific epithet. Some scientists make an extensive use of subgenera and/or subspecies. Such combinations are flagged in MolluscaBase as “alternate representation”, i.e. both name strings (with/without subgenus, with/without subspecies) are taxonomically correct, but only the binomen is flagged as “accepted”. Other status include “taxon inquirendum”, for a name which is listed from a literature source, but has not been recently re-evaluated for taxonomic validity and/or generic or familial placement, and “nomen dubium” for a name which resists revision because the description and other supporting data are deficient. During the workshop bulk data were submitted for European and South African species, which will soon appear online. Please be patient to see all Neotropical taxa be added to the system. And if you publish new papers containing new Neotropical land and freshwater molluscs, be so kind to send me a PDF once this is available and I’ll make sure the data are added to MolluscaBase: http://www.molluscabase.org. This entry was posted in Uncategorized and tagged varia on February 9, 2018 by bramb.